Election boycott is not a crime, rather, it is a form of protest or civil disobedience against the hostile government of an oppressive establishment. There are no attached consequences of doing that, for it is ones inalienable right. In democracy, power belongs to the people, and nobody can take that power away from us, which is why we must use it the way we want. It is my plea to the people of Anambra to sacrifice November 18, 2017 for the sake of freedom of our dear and long awaited nation of Biafra. We all saw what happened in Enugu on 4th November 2017. There was nearly a 100% boycott of the chairmanship elections by the people of Enugu state. Such is exactly what we want to see in Anambra in the forthcoming gubernatorial election slated on the 18th of November. Enugu people made us proud, we also want you, the people of Anambra to do likewise. We vowed to restore Biafra using every means necessary, hence election boycott is inclusive. And it is necessarily needed in Anambra at this moment. It is our collective efforts that will make Anambra election boycott successful. You can't fold your arms while sitting at the comfort of your home, office, beer parlour and the rest of other places and expect election to be successfully boycotted by our people. As it stands now, do whatever you can to ensure a successful election boycott in Anambra state. Do whatever you can in your own way to ensure that the slated election is completely boycotted. Now is the time, and we cannot afford to miss it. There has been a peak of marginalization by the government to our people, so it is time we also marginalized the government and the political conspirators. The truth is that election will hold, but it is our duty to boycott it. Not everyone believes in Biafra, hence we must give them convincing reasons to boycott the election. Prove to them beyond every reasonable doubt that Anambra election is very pivotal in the struggle to restore Biafra. For example, a date for referendum will be announced immediately after a successful election boycott in Anambra. In fact, the freedom of Biafra depends on the successful boycott of Anambra election. Another worldwide attention will be attracted to Biafra and the struggle to attain freedom, if Anambra election is successfully boycotted. 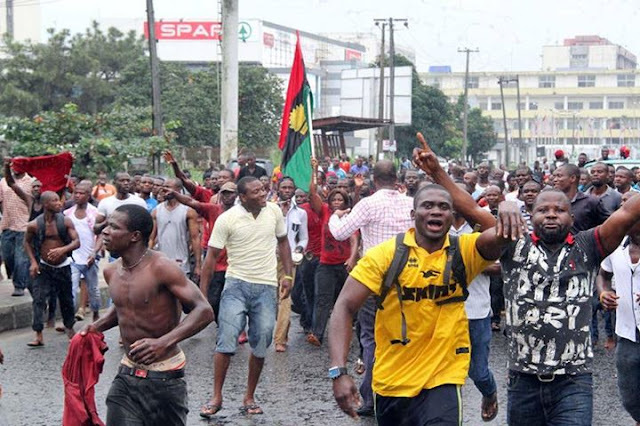 There's no doubt that a successful election boycott in Anambra will fast-track Biafra freedom. There's a great need to cease the chance and utilize it. It is called " civil disobedience" and it's very pivotal in every freedom fighting movement. Mahatma Gandhi of India amongst others used it to gain India's freedom. Of course, we can also employ the steps and procedures used by other freedom fighters to also gain our freedom. It's not a big deal to sit at home just for one day. Do it for freedom, not for IPOB or Nnamdi Kanu. Do it for the sake of our younger generation, your children yet unborn and many more generations to come. The truth is that our generations yet unborn may not have the opportunity to fight for freedom as we are doing today. This is because their own future is completely at stake and may be worst than what is obtainable today in the present Nigeria. Remember we are suffering today because our fathers failed to get our freedom in the 90's when they fought for it. We cannot afford to repeat that costly mistake again, for it will be gravely suicidal. Imagine if they had succeeded, we won't be in this mess and hell we are today. So we must restore Biafra for the sake of our younger ones and our children yet unborn. Sit at home and enjoy yourselves with the spicy ofe nsala. A beautiful future awaits us in a free Biafra state. Spread the message to all nukes and crannies of Anambra state. Thanks and remain blessed as you sit at home on Saturday, November 18.